News from the Naibabad freight terminal, with some photos of goods being unloaded from trains. NIABABAD, Afghanistan – 1st Theater Sustainment Command, Afghan Rail Advisory Team, host a Key Leader Engagement with members of the Afghanistan Ministry of Customs and Industry at rail Port 4, Niababad, Afghanistan, Oct 13. The ARAT team is comprised of civilian and military railroad operational and business experts who are working with the Afghanistan Railway Authority on a train, advise and assist mission. They also provide the ARA with railroad advice, and options on improving rail operations, safety, law enforcement and railway industry development. Maj. Timothy Christensen leads the ARAT, hosted by the Afghan MOCI delegation at rail Port 4. The rail hub crosses the famed Friendship Bridge and links Mazar-i-Sharif, Afghanistan and Uzbekistan in the north. 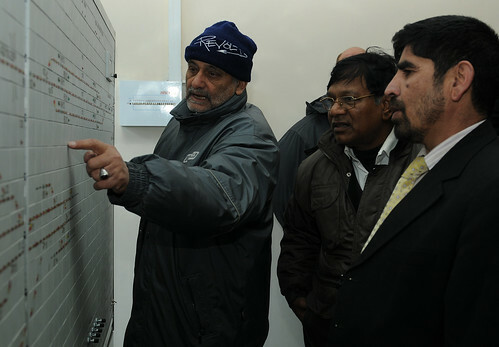 They presented the Afghan delegation with a map of the existing rail infrastructure at the port. The map was created by the Transportation Engineering Agency, which is part of Surface Deployment Distribution Command. Additionally, the team’s mission was to address the Afghan’s railroad business concerns. After the meeting the ARAT team and Afghan delegation toured the rail facility. DVIDS story published 28 October 2013. JCOP HAIRATAN, Afghanistan – Maj. Timothy Christensen, Manchester, Conn., native, and Afghan rail advisory team director, 1st Theater Sustainment Command, and Brig. Gen. Duane Gamble, 1st TSC, deputy commanding general, native of Arbutus, Md., survey Afghan Northern Distribution Network Rail Port 2, managed by Afghanistan Ministry of Customs and Industry, for future retrograde operations during a Regional Command North battlefield circulation, Oct. 14, 2013. The port survey, security, and support element was comprised of joint, active duty, Army National Guard and Army Reserve combat enabling and support soldiers. The active duty soldiers were assigned to 2nd Platoon, Cherokee Troop, 6th Squadron, 4th Calvary Regiment, 3rd Brigade Combat Team, 1st Infantry Division, from Fort Knox, Ky., the 101st Sustainment Brigade, 101st Airborne Division, Fort Knox, Ky., and the 524th Combat Sustainment Support Battalion, Schofield Barracks, Hawaii. The Army National Guard soldiers were from the 1230th Transportation Company, Georgia Army National Guard, from Thomasville, Ga., and a combined leadership, survey team of active duty Army and Army Reserve combat sustainer soldiers from the 1st Theater Sustainment Command, from Fort Bragg, N.C. The joint team came together to survey the rail port and provide subject matter expert guidance on future retrograde operations. DVIDS has three articles about the Hayratan port by Michael Vanpool. … more than half of everything arriving into country is from the trains in Hairatan. “[International Security Assistance Force] cargo comes through trains, and also fuel comes through here as well,” said Maj. Jason Cole, tactical command post officer in charge, 101st Sus. Bde. Joint Combat Outpost Hairatan. Railroads in Afghanistan are starting to be embraced more by the country, after decades of war halted the expansion of trains into the country. Now the rails are planned to grow from the north down to the other provinces. The rail line at the Hairatan Gate Border Crossing provides residents in Northern Afghanistan not only a chance for economic stability, but a means for helping troops get cargo and equipment back home during the future drawdown. [Hayratan] is the first and only border crossing with a functioning rail line which currently runs from Hairatan all the way to Mazar-E-Sharif. The intent is to re-establish the distribution network in the north through Europe and Central Asia, and tie that line into its infrastructure. Finally, while promoting economic stability in the region, establishing a rail line at the Hairatan gate border crossing fits firmly into the intent laid out by International Security Assistance Forces Commander Gen. David Petraeus to create a means of a future withdrawal from Afghanistan. “We’re trying to think two to three steps ahead of where we’re at. A safe, reliable route from Afghanistan is a plus,” Wentworth said. “But we also need to ensure that we’re meeting [President Obama’s] intent and conditions that are being laid out. The rail line was funded by the Central Asian banks and the Uzbekistan government built it. Members of the Afghan National Border Police listen to an instructor as they search locomotive TEM2 6773 near the Hayratan border crossing point (Photo: DVIDS, 2011-01-10). HAIRATAN, Afghanistan — Recently, soldiers of the Military Police “Mohawk” Platoon of 10th Mountain Division’s 1st Brigade Special Troops Battalion in conjunction with the Border Management Task Force trained members of Afghan National Border Police for a Contraband Enforcement Team at the Friendship Bridge border crossing in northern Afghanistan. 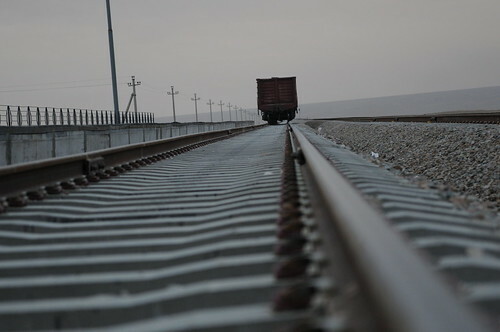 BALKH PROVINCE, Afghanistan – An ambitious railroad project could see an increase in cargo supply movements and potentially create strong economic development and stability for the northern Afghanistan community. The 101st Sustainment Brigade Commander Col. Michael Peterman and members of his staff spent several days visiting with key government officials in the Hairaton district to discuss plans to re-establish a distribution network in the north from Europe. Most of the ground freight in that region comes through Pakistan. The Hairaton Gate crossing is the only border crossing point with a rail line, according to Peterman. The Lifeliner’s role in the project would be to tie the infrastructure in northern Afghanistan to that network, he said. The brigade sent a team to Hairaton Gate to help build container yards for the project. Peterman referred to Gen. David Petraeus’ initiative on helping get the Northern Distribution Network – a network of trains, ports and airplanes coming directly from Central Europe into Afghanistan- run efficiently. It would also mean the brigade would coach, mentor and teach Afghan commerce, business and military leaders on how to conduct cross-border logistics in Hairaton, he said. “The truth is, that freight is going to come. We have to figure out how to educate the Afghans to make sure it moves efficiently down to rest of the battle space. We’ll be critical to have in terms of coaching and monitoring, along with our Afghan partners,” Peterman said. The commander said while the focus in Regional Command East has been counterinsurgency and security (with the intent to gain a space for economics to grow), the northern region has a strong governor and security. “We have an opportunity, with that rail line and commercial trucking, to move that portion of the country forward economically and also reinforce governance for tens of millions of dollars that’s going to come across that port in the next year that’s going to go directly to Afghan taxpayers,” he said. “We had a great dialogue with Gov. Atta, as well as daily meetings with the port authority … to let him know what this means to him economically. He’s a very smart man, and he understands developmentally what this means to his country,” he said. “Those concerns are no different than a small town in America that’s right next to a rail hub, if you can picture it,” he said. “If we put Afghans to work, it will have less negative effects on his community,” he said. Peterman said engagements by USAID, the European Union and others are also coming into play regarding Afghanistan’s economic future. He also said the project fits in with President Obama’s intent of having combat troops leave Afghanistan by 2014. “The trains are going to have to get that combat power out some way,” he said. KABUL, Afghanistan – A railroad, under construction from the border of Uzbekistan to just beyond Mazar-e-Sharif [My understanding was that it stops short of the city?] in northern Afghanistan, is expected to see an increase in utilization by several organizations and traders upon its completion. Last week, Afghan officials, international aid representatives and International Security Assistance Forces visited Hairaten to look at the railroad along the border-crossing to ensure that the railroad is being used and implemented to benefit the people of the area. The track is more than 46 miles (75 kilometers) long and stretches from the bridge connecting Uzbekistan to Afghanistan through Hairaten to Mazar-e Sharif. It cost more than $170 million to build the track, which was largely funded by the Asian Development Bank. The track will also be used to transport construction material to several major projects in and around Mazar-e Sharif, including the Mazar-e Sharif International Airport. There are plans to continue the rail system to Herat and to eastern Afghanistan. The track and stations employ hundreds of Afghans to operate it and keep it secure. KABUL, Afghanistan – A new international airport in Mazar-e Sharif is scheduled to be complete in January 2012 and will assist with trade and transporting goods throughout Afghanistan. More than 300,000 people live in the vicinity of Mazar-e Sharif and people will reap the benefits of being able to transport their goods throughout the country. Currently, the airport is host to more than 100,000 passengers per year and is projected to host more than 400,000 after the construction is complete. Construction of the airport is employing hundreds of local Afghans to lay foundation, construct more than five buildings and maintain the airport. A new terminal, repairs to the old terminal, a security building and a fire response building are some of the projected projects. The airport is designed not only for passengers, but also to work in conjunction with the new rail system located a couple of miles away, that was recently built to support economic growth. The new railway is bringing in construction supplies to the airport. The decision to build the airport was made in 2008 and is part of a development project to bring five international airports to Afghanistan.